Playa Guiones, in the town of Nosara, Costa Rica has long been known by the wider international community of surfers as a hidden gem and off-grid paradise of white sand beaches and constant waves. Decades ago the first wooden house in town was built close to the beach-break and in time this simple structure became the perfect resting place for transient surfers as well as a gathering venue for music, food, and interaction. 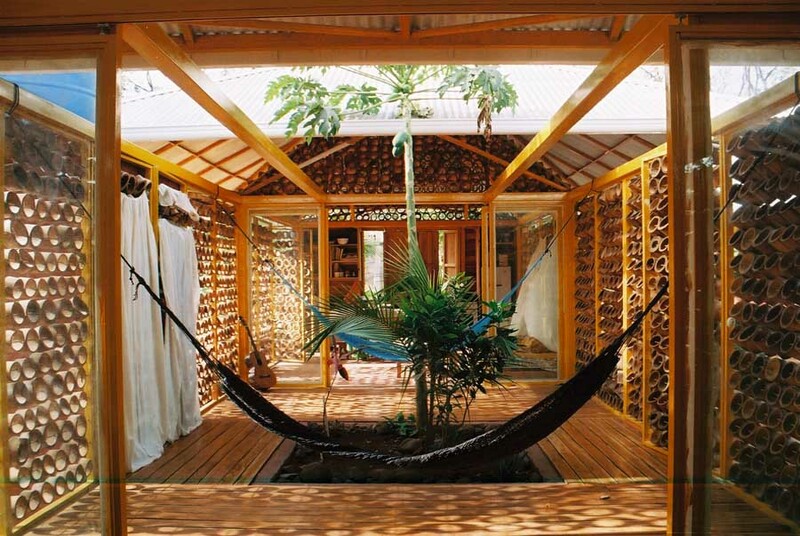 The Gilded Iguana was born! 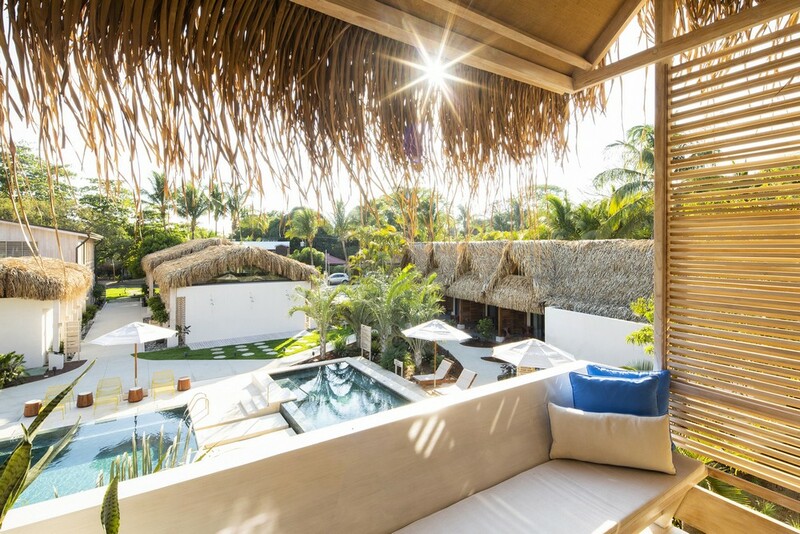 Today Nosara still attracts avid surfers from around the world however it has also become a destination for yogis, the wellness community, and families looking for healthy fun and adventure. 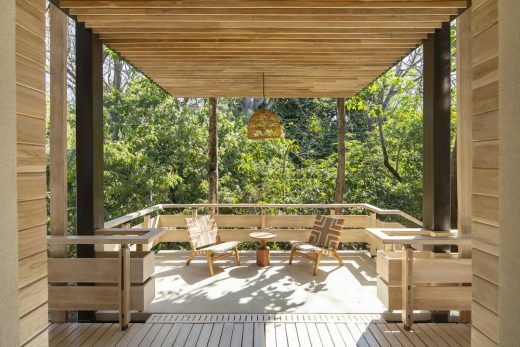 Everyone shares a common goal to preserve the natural habitat and the low-key unpretentious essence of the place. 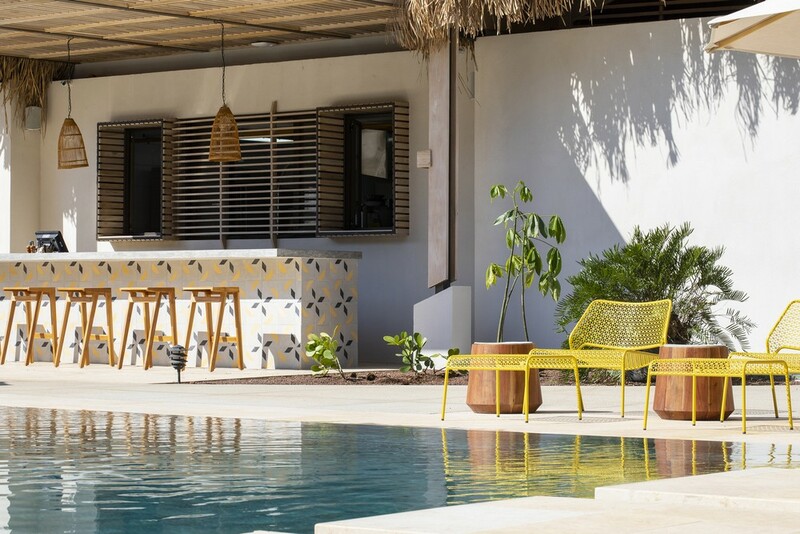 Studio Saxe was commissioned to expand and rethink the entire Gilded Iguana Hotel as a destination that addresses modern comforts and adapts to the new wave of travelers coming to the area whilst preserving the rich historical importance of the location. Together with the owners, we decided to restore and revitalize the existing dilapidated house structure as a tribute to the memory it holds for locals, travelers, and the town at large. 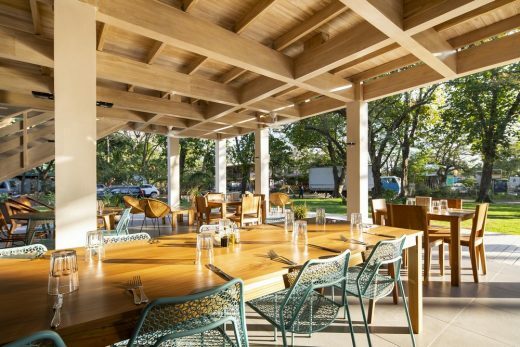 The new restaurant that now sits there has already become a town favorite for food, concerts, and general gatherings. 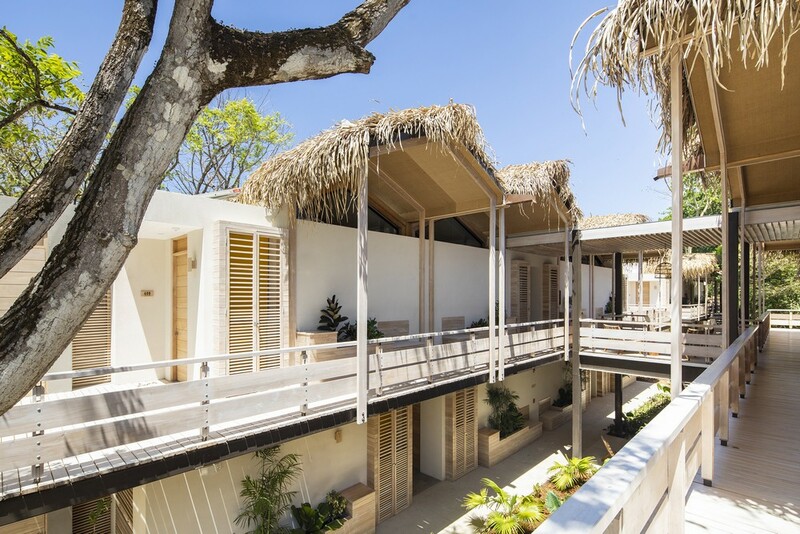 The Gilded Iguana beach-house historic restoration is also one of very few samples in Costa Rica that acknowledges the importance of preservation of traditional tropical architecture. 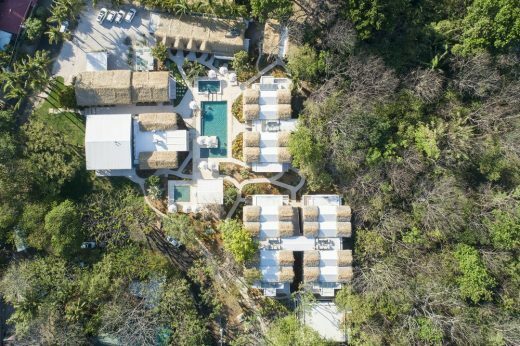 The studio worked hard to complement the existing house with new structures poised around the property amongst the existing trees and in turn create a heart center framed by a fantastic communal area-pool for all guests to enjoy. The new Room Buildings along with the Reception and SPA areas combine elements of the old house such as the simple wooden frames and balconies with typical hand-made palm thatch “palapas” commonly found on the beach for shade. 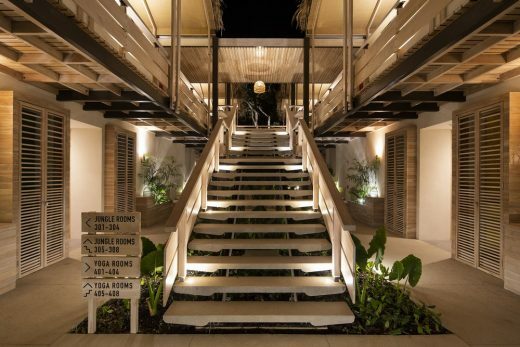 In contrast to typical enclosed and hermetic hotel developments in Latin America, the Reception area and Restaurant at The Gilded Iguana completely open up to the town of Nosara creating a subtle, relaxed, and unpretentious atmosphere where anyone can come in. 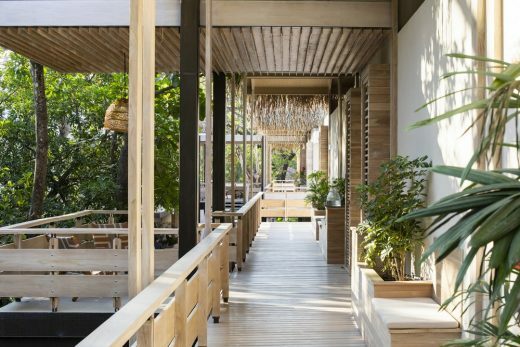 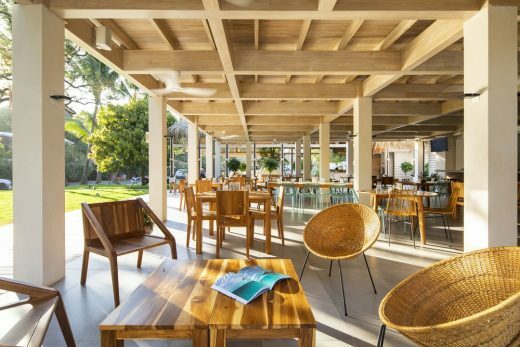 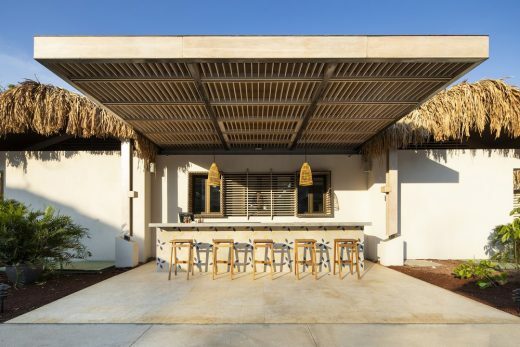 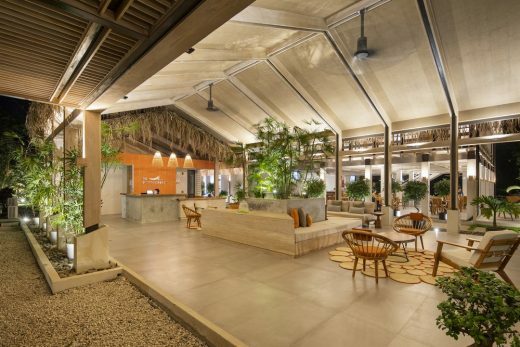 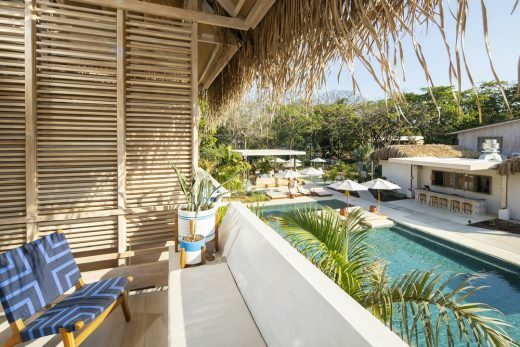 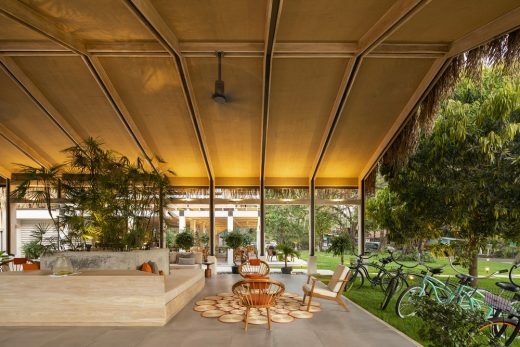 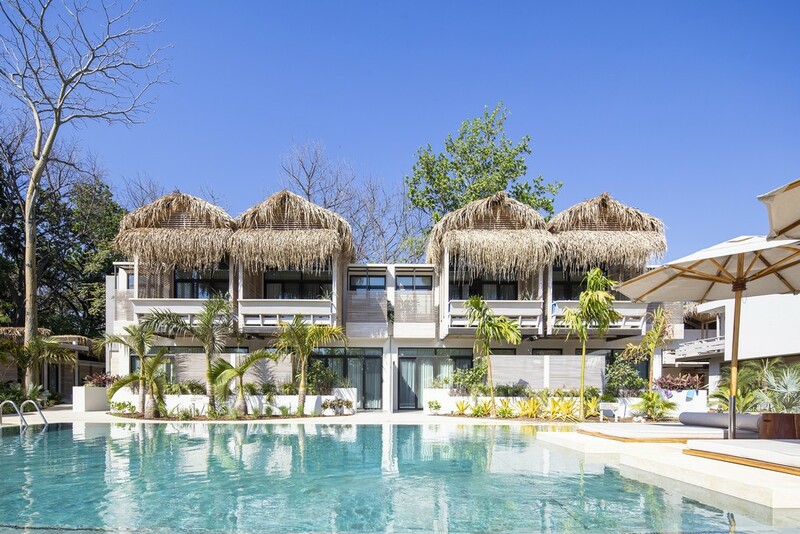 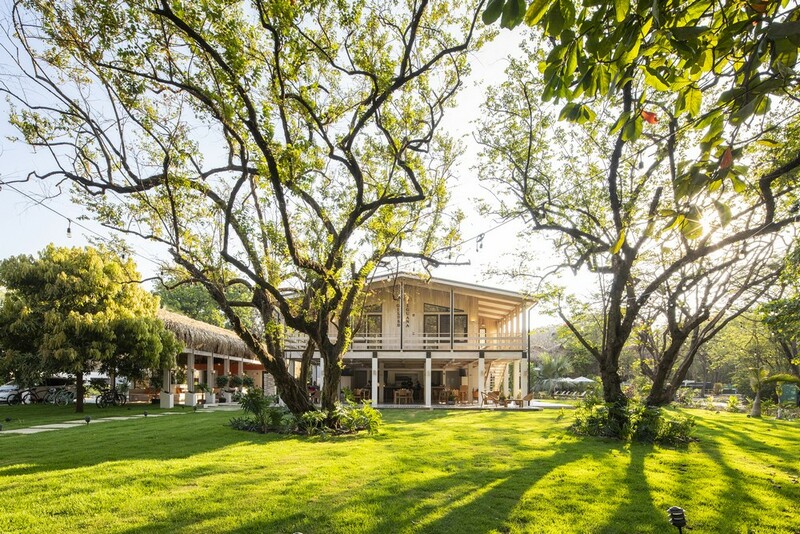 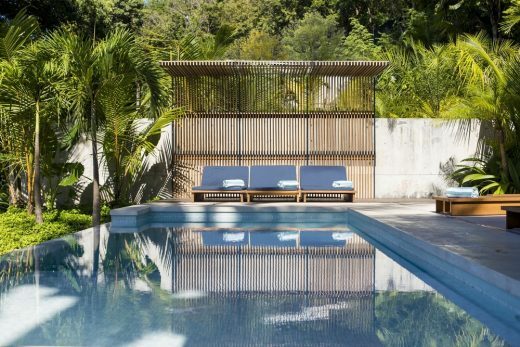 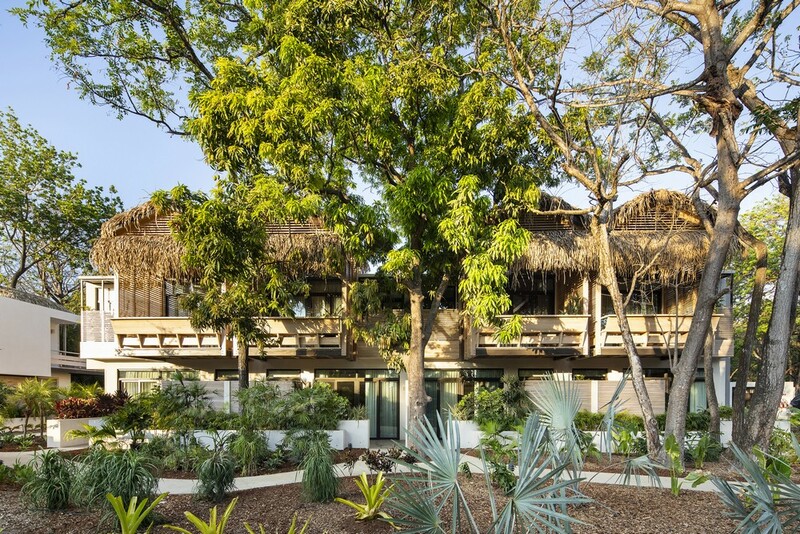 The architecture and interiors throughout combine simple and unpolished materials such as teak, palm thatch, jute fabric, and concrete tiles with modern tropical furniture made with local materials and craftsmanship. 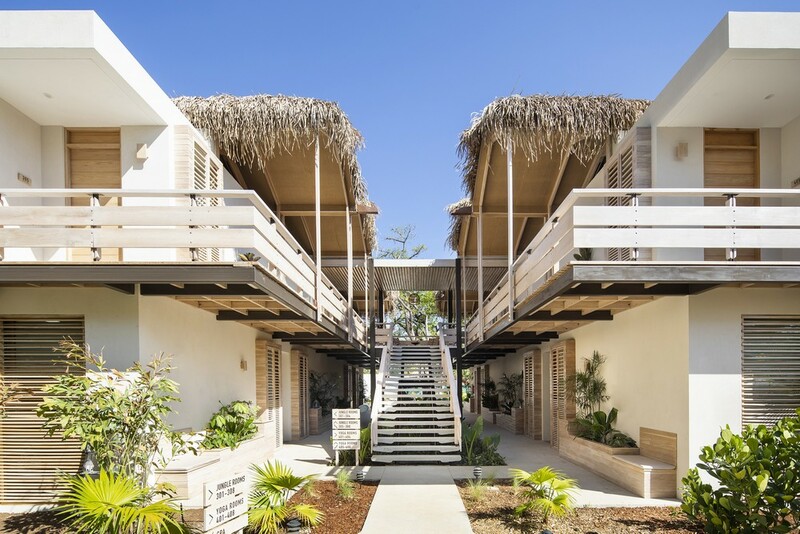 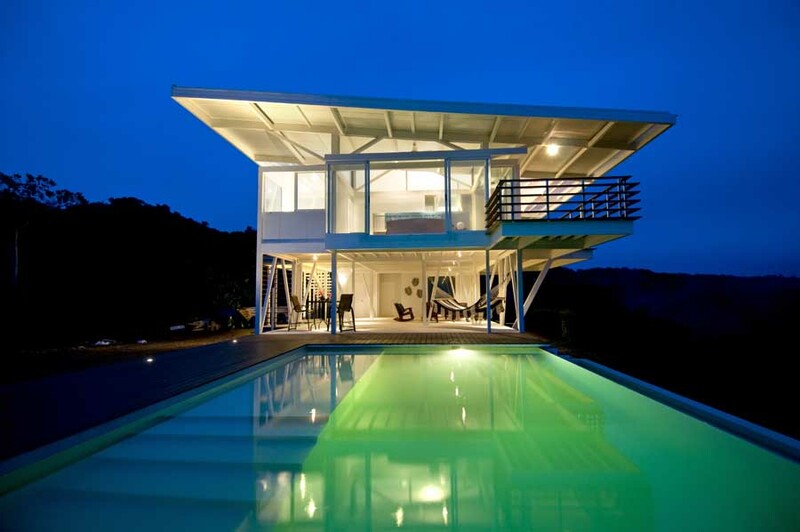 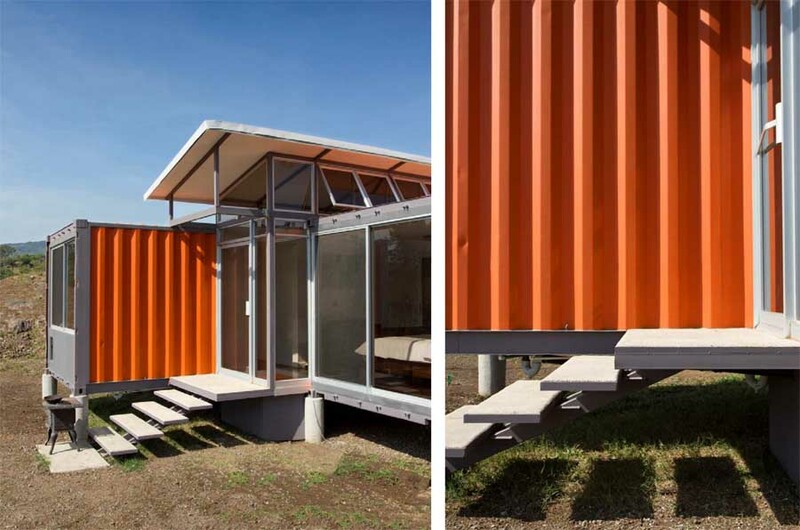 Room Buildings cater to a varied type of traveler depending on their orientation. Pool Rooms are ideal for families, Jungle Rooms create a more private experience, and Surfer Rooms promote a more social interaction amongst travelers. 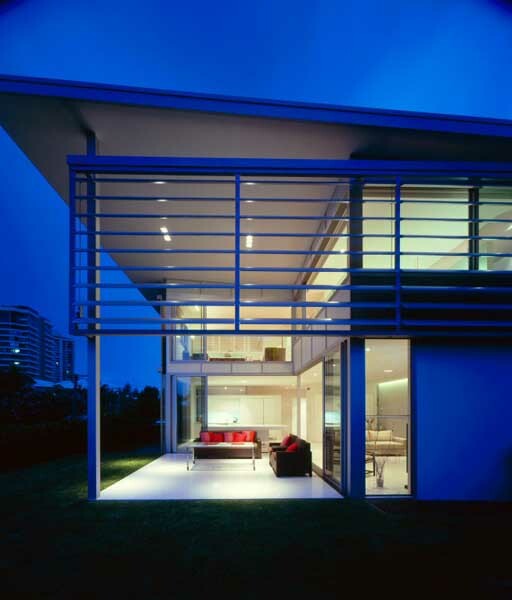 Each room has a large outdoor terrace that brings the outside in and allows for bedrooms to be connected strongly to the outside. Private gardens are incorporated into showers and the play of light and shadows constantly fills every space with an acute awareness of the natural environment. 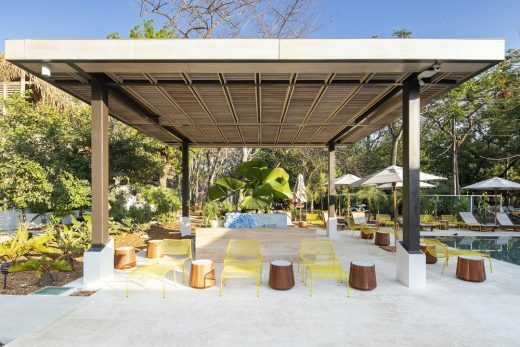 Walking around the Gilded Iguana is always an opportunity to encounter and mingle. 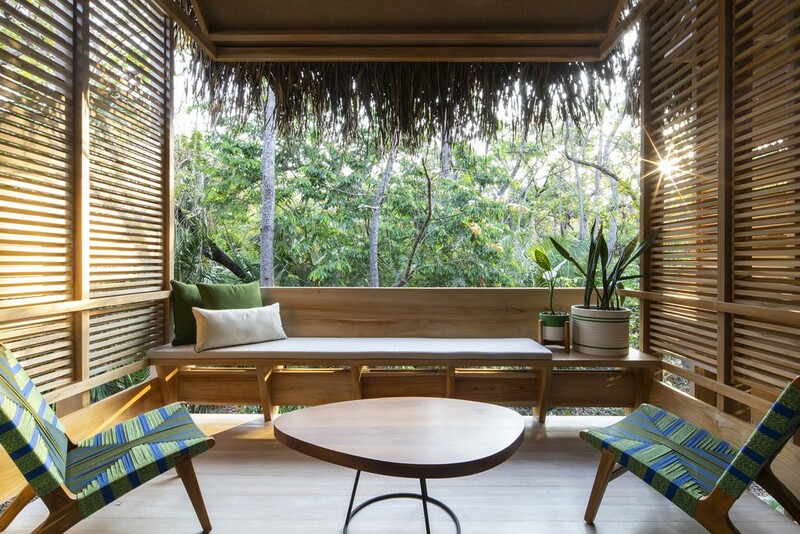 The studio carefully placed seating areas as well as water stations and surfboard racks along the entire property which in turn provoke interaction amongst guests and a more down-to-earth and authentic experience amongst travelers. 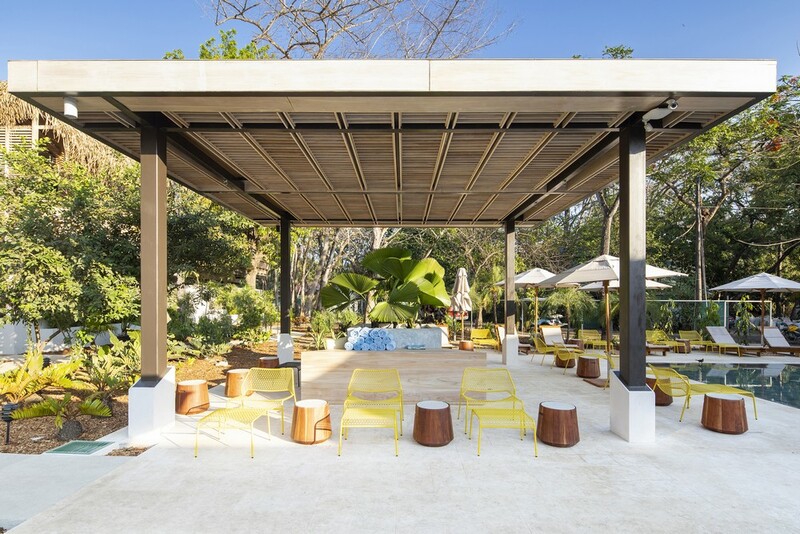 The pool area is truly the heart center for guests at the Gilded Iguana. It is here where the sun and water come together in a place where adults and children can enjoy the tropical weather, relax, read a book, or play. The simple geometry and natural pool stone tiles combine perfectly with the old house and the new structures around the property. 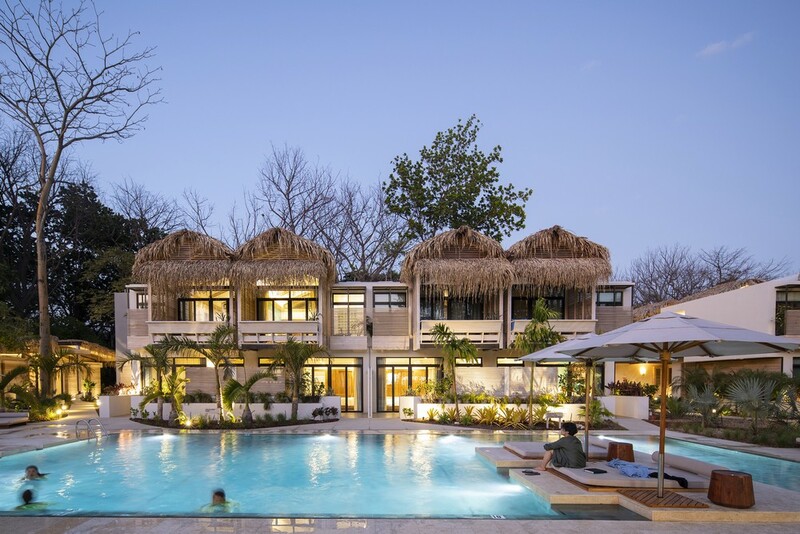 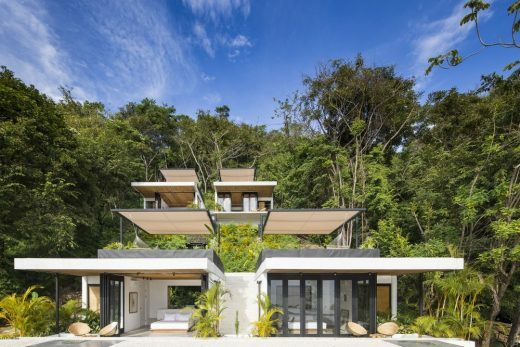 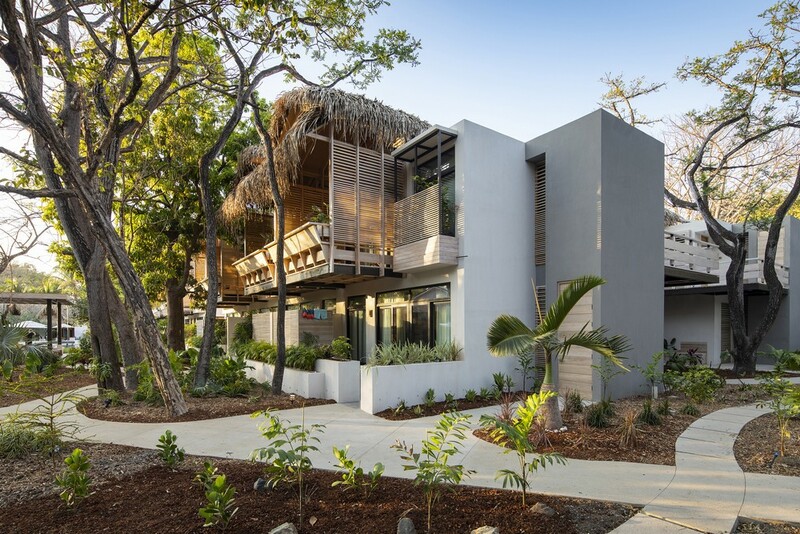 The Gilded Iguana Hotel was conceived through Bioclimatic Design to take advantage of solar orientation, shade, wind currents, and others to create comfort through passive strategies of temperature control. 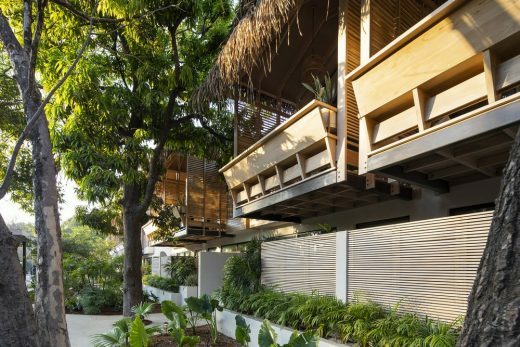 Additionally, Studio Saxe worked hard with active sustainable technological measures such as water recycling through water treatment systems, solar hot water, and energy harnessing through photovoltaic. Locally resourced materials, such as teak from certified sustainable farms, and local manual labor was used throughout the project to create a positive impact in the town of Nosara and generate new jobs for the community.